The Canadiens started the season with a 1-6-1 record, matching their worst eight-game start in 76 years. It never got better. They have been shut out 12 times this season, the most in franchise history. The team allowed 26 shots in one period this month, again the most in franchise history. They have lost 24 road games in regulation, another franchise record. In a league where scoring is at a premium, the team’s scoring differential is abysmal. Related: The Worst Canadiens Team of All Time? Gallagher has managed to persevere this season despite that the Canadiens lack talent at center and mobility on the blue line. Drafted 147th overall in 2010, he was often seen as too small to succeed in the NHL. With a career-high 49 points this season and five games to go, he has proven everyone wrong. This year he has managed to add some sweet goals to his highlight reel. Last season was Gallagher’s worst since his rookie campaign. His meager 29 points after three consecutive seasons of 40 or more points can largely be explained by the two slap shots he took to his hand in just over a year. The first from Johnny Boychuk in November 2015 broke two fingers on his left hand and kept him out for 17 games. The second, from teammate Shea Weber in January of 2017, fractured his left hand and kept him out of the lineup for nearly 8 weeks. Shattering fingers in his left hand in consecutive seasons required three plates and over 30 screws to repair the damage. It also meant he had to change how he held his stick. When asked about his hands Gallagher said, “…they’re different but I’ve learned to adjust.” Rebounding from injury is never easy but he put the time in and brought renewed energy to the team this year. It has been painful listening to Montreal Canadiens games on the radio this year. Sergio Momesso, the Habs’ color commentator for TSN Radio 690, has regularly called out specific players for a lack of effort and grit. @CanadiensMTL have to agree with Momesso..Drouin played soft.. especially in the defensive zone..
Gallagher never comes in for criticism, no small feat. As a veteran, at 25, he is one of the few Habs that have not been traded or otherwise released since 2015. He has seen the team at its recent best and this season at its worst. But he made the most of his chance to get back to his pesky, persistent, and productive ways and emerged as an exemplary leader. 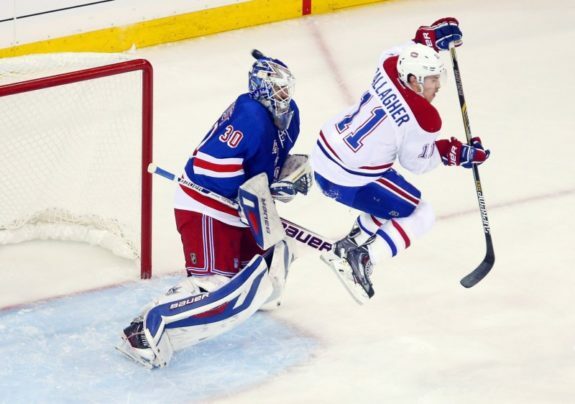 Brendan Gallagher will give 100-percent effort on every shift; Gallagher will get whacked like a piñata in front of the opposing net and get up smiling, ready for more; and Gallagher will be in the locker room after the game to face the media — win or lose. Those are the easy goals for me. Most of my goals are on deflections in front or by battling in the crease. They may not seem easy but they’re easier for me than trying to beat a goalie with my shot. If Pacioretty is traded over the summer, the Canadiens need to make a choice about who should be the next captain. While Weber has to be in the conversation, Gallagher should be considered the Habs’ captain in waiting. He is a 5-year veteran of the team, the leading scorer, and most importantly, brings top effort to every game and during every shift.